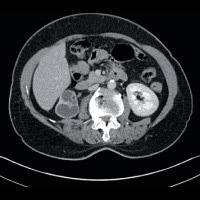 A 57-year-old woman presented to an outside facility with hematuria and a urinary tract infection. She was diagnosed with genitourinary tuberculosis and treated for nine months with antituberculosis drugs. She presented to our institution with recurrent hematuria and frequent urination. 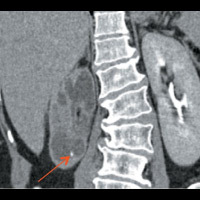 CT of the abdomen and pelvis demonstrated nonuniform caliectasis in the right kidney with associated renal cortical atrophy, consistent with multifocal strictures (Figures A and B). There was mild urothelial thickening in the renal pelvis and right ureter (Figures C and D). Excretory urography demonstrated a delay in contrast opacification of the intrarenal collecting system. Only a trace amount of contrast was present in a few of the dilated calyces in the right kidney eight minutes after injection of iodinated contrast (Figures E and F). No significant excretion of contrast was otherwise seen in the right collecting system. The genitourinary tract is the most common site of extrapulmonary tuberculosis. Approximately 25% of patients with genitourinary tuberculosis have a known history of prior pulmonary tuberculosis. There generally is a long latency period (five to 40 years) between initial infection and the development of genitourinary disease. 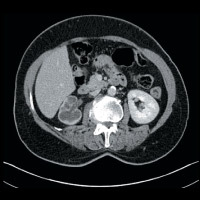 Clinical presentation is nonspecific and can include hematuria, flank pain, dysuria, and/or constitutional symptoms. Positive urine cultures or a histopathological exam of surgical or biopsy specimens establishes a definitive diagnosis. Renal tuberculosis affects men more than women, and patients usually present at age 50 or younger. The pathogenesis of renal tuberculosis occurs when the kidney becomes infected by the hematogenous spread of the Mycobacterium bacilli from the lung. This seeding leads to granuloma formation in the renal cortex, adjacent to the glomeruli. In immunocompetent patients, the disease is confined to the cortex. When there is a breakdown of the host’s defense, this leads to reactivation of the cortical granulomas, which enlarge and subsequently coalesce. Capillary rupture leads to the bacteria forming caseating granulomas and papillary necrosis. The healing response leads to fibrosis, strictures, and calcium formation, which can obstruct the kidney and lead to progressive dysfunction. 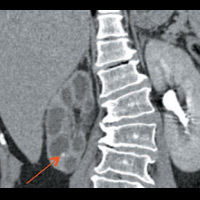 CT is the imaging method of choice, with the affected kidney generally having one of two morphological appearances: pyelonephritis or pseudotumoral type. The pyelonephritis appearance demonstrates hypoperfusion and swelling of all or part of the kidney. The pseudotumoral appearance can look like single or multiple nodules. Additional imaging findings can be bilateral but usually asymmetric: calcifications (stones, globular, ringlike, or papillary); cortical scarring; “smudged” papillae; infundibular strictures; hydronephrosis; or autonephrectomy. CT appearance also can vary with the stage of disease. Early disease is characterized by papillary necrosis, which results in uneven caliectasis. Progressive disease results in multifocal stricturing with subsequent nonuniform hydronephrosis and mural thickening with poor parenchymal enhancement. End-stage disease has worsening hydronephrosis with parenchymal thinning mimicking multiple cysts; dystrophic calcifications also can be present. Ultrasound appearance is nonspecific and variable depending on the stage of disease. Early disease can demonstrate a normal kidney or one with small focal cortical lesions. 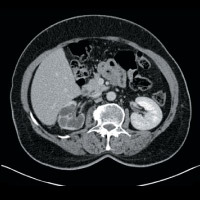 Progressive disease shows papillary destruction with echogenic masses near the calyces, distorted renal parenchyma, and irregular hypoechoic masses that connect to the collecting system. A small, shrunken kidney with a very thin cortex and dystrophic calcifications generally characterizes end-stage disease. 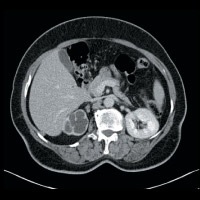 Differential diagnostic considerations include chronic pyelonephritis, papillary necrosis, medullary sponge kidney, calyceal diverticulum, xanthogranulomatous pyelonephritis, transitional cell cancer, and renal cell cancer. Treatment is with multi drug antituberculosis medications. Despite treatment, stricturing can still progress. Nephrectomy or partial nephrectomy can also be performed depending on the level of renal involvement. — Amish Patel, MD, is the women’s imaging fellow and an assistant professor of radiology at the University of Connecticut Health Center. — Marco Molina, MD, is the section head for body imaging and an assistant professor of radiology at the University of Connecticut Health Center.